In the mood for some easy to make at home Mexican food? 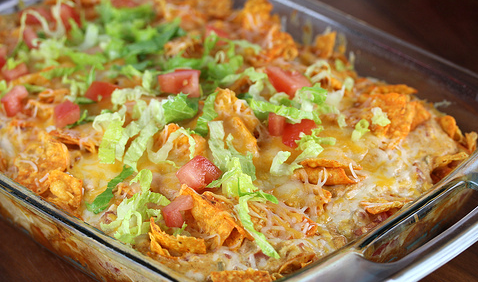 This recipe for Chicken Taco Casserole ought to do the trick! What we love most about this recipe is how easily customizable it is for your taste. Feel free to experiment by adding beans, corn, olives, chipotle tabasco sauce — you name it, get creative! At Passanante’s Home Food Services we know you’re busy, which is why we’re always looking for delicious recipes that require very little time to prepare. If you have any recipes that you would like to share, we’d love to see them. Pop over to our Facebook Page and share your tasty creation with your fellow foodies. Still not sure if our food delivery service is right for you? Click here to get a FREE gourmet food sample — we promise you won’t regret it! Top with lettuce, tomatoes, sliced pickled jalapeños, and avocado bites. In a hurry? No problem. You can make Chicken Taco Casserole in the microwave! Let set for 3 minutes and serve. This entry was posted in Poultry, Recipes and tagged Chicken Taco Casserole, Food Delivery Service, Free, Passanante's Home Food Service, Recipe by Passanante's Home Food Service. Bookmark the permalink.